Report: Europe & Islam – whose identity crisis? Europe has, according to the Pew Forum, about 38 million Muslims – about five percent of its population and that proportion will continue to increase. Yet, we are facing a growing mutual mistrust that leaves Europe on the verge of a dangerous rift. One of the major cultural challenges that we face today is whether we can overcome the fear that difference and diversity will weaken national and social cohesion and succeed in building a Europe that is enriched by its different cultural identities. In a continent progressively challenged by mixed identities, who is it with the identity crisis Europe, or Islam, or both? Are Europe and Islam reconcilable? Does an increase in extremism, euroscepticism, islamophobia and a move back towards nationalism indicate that people are increasingly apprehensive of those who identify themselves in different ways? 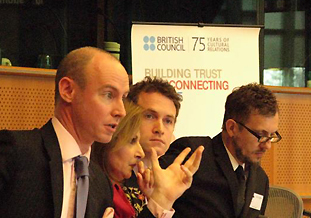 These issues were addressed in a high-profile debate that was held at the European Parliament in Brussels on Thursday 19th November and which was organised by the British Council in partnership with the European Muslim Network. Participants included the host of the debate Sajjad Karim MEP, Pál Schmitt (Vice-President of the European Parliament), Daniel Hannan MEP, Chris Allen (Anti-Islamophobia advocate), Douglas Murray (Director, Centre for Social Cohesion) and Bashy Quraishy (Chair Advisory Council, European Network Against Racism). The debate, moderated by Shada Islam from the European Policy Centre, examined the complex issue of identity in particular within the European Muslim context from a variety of viewpoints and perspectives. Chris Allen called for renewed efforts to promote a more balanced representation of Muslims and to enhance “an understanding of ‘we’ rather than ‘us’ and ‘them'” to dismantle mistrust and misunderstanding. The Our Shared Europe debate in Brussels will be followed by a series of televised events in February 2010 in London and Lisbon. Probablt one of thw worst debates I have attended for a while now. Previous Post Sikh man to be first non-white member of the BNP: why the surprise? Next Post Do we have a ‘shared Europe’…?